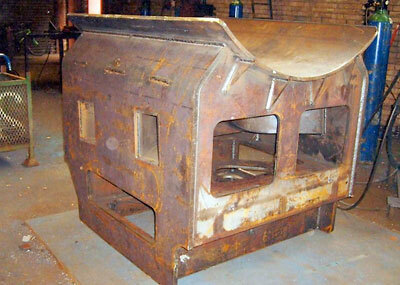 Fabrication of the smokebox saddle has been completed. 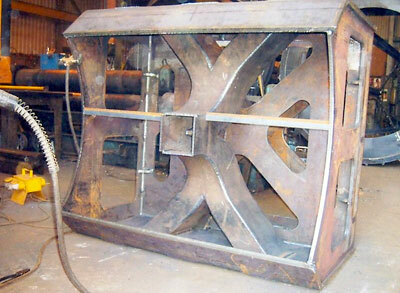 This impressive piece of kit (which is estimated to weigh between 1 and 1 1/2 tons) has been made jointly by T.R. Fabrications Ltd. of Dinnington and Dave Hewson of Sheffield. Many thanks to all concerned. This component of the new locomotive is now at Machined Fabrications of Dudley for machining and drilling. The firebox support bracket, which we have had in store at Bridgnorth for a little while, is to go to The Boro' Foundry Ltd. at Lye for machining. The frame keeps are now finished and fitted. The various brackets for footplating and mechanical lubricators are bolted on awaiting the big riveting session. The support bracket for the driver's pedestal is now made and will shortly be in a similar status. A start has been made on machining the backing plates for the manganese liners for the horn blocks & guides. Still a fair bit of work to be done on this area of the chassis though. Remember to buy your raffle tickets for this years draw. The draw will be held on Sunday 22nd May 2011 at Bridgnorth and the first prize is a 32 mile footplate ride on the SVR. Tickets are available from Barbara Massau and cost £1 each (£5 for a book). They will also be available on our sales stands at Bridgnorth and Kidderminster over Easter, the Members & Shareholders weekend and the 1960`s weekend. Our first full Annual General Meeting was very well attended, with 44 people present in addition to the committee members. Over 30 people sent their apologies. It was a pleasant and upbeat meeting, with Chris in the chair and Barbara, Tony and Alan giving their respective reports. Main interest of course centred on Tony's Engineering Report and he gave a summary of developments over the past twelve months and plans for the next twelve, encompassing completion and riveting of the chassis; casting, machining and fitting of the motion brackets; and commissioning the pattern for the cylinders, which will be cast as soon as possible. There was plenty of discussion from the floor, and the meeting finished at approximately 15.40. The committee were all re-elected unanimously, so it looks as though you've got us for another year! Member Neil Cocksedge's quiz was won by Mr J. Gardner, with the five runners-up to be announced in the near future. Mr Gardner's prize of a fooplate ride will be arranged as soon as possible. Many thanks to Neil for all his hard work, and congratulations to Mr Gardner on achieving such a good score in what was a tough test of railway knowledge. Chris sent the images of our smokebox saddle, with a short caption press release, to the hobby press earlier this month and was immediately contacted by the Editor of one of the leading magazines who told him that, in his opinion, the 82045 project is "the most worthwhile of all the current new build projects" and said that he fully understands the rationale behind our decision to build the Riddles tank. We hope to be able to turn this into some positive publicity in due course, and are considering asking the magazine concerned to help us appeal for funding for the boiler - some way off yet, but not all that distant when you remember that we are shortly to start directing our attention to the next major stage of the project, which is to wheel the chassis. Fingers crossed all round, as the sooner 82045 is up and running, the better! 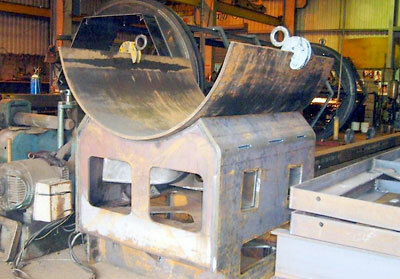 The smokebox saddle shown in various stages of completion. Photographs by: Dave Hewson.